Returning for a third year, the 2017 Yamaha YZF-R3 is the smallest motorcycle in Yamaha’s supersport category. 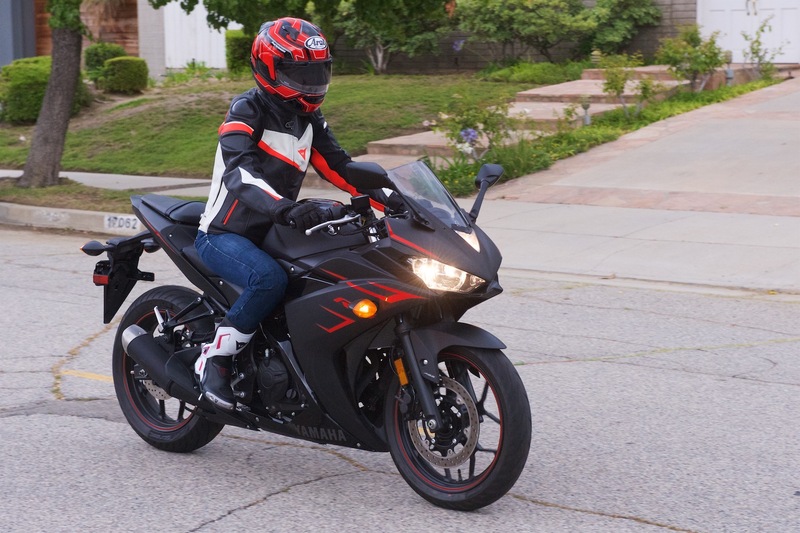 The Yamaha R3 continues to be a great choice for novice riders who are developing their sport riding skills and want to learn how to get the most out of the 321cc parallel twin. We recently spent some time riding the 2017 Yamaha R3; here are the essential Fast Facts. 1. The Yamaha YZF-R3 has an ABS option for the first time in 2017. For $300 you can add ABS to your R3. There’s no reason not to take advantage of this extra security for peace of mind when traction is less than ideal. 2. The YZF-R3 is comfortable around town, despite supersport ergonomics. Yes, the R3 has clip-on bars, but there are risers and the grips sit above the top of the triple clamp. You still get an aggressive forward stance, but you can sit up in the saddle for around town riding without fatigue; the reach to the handlebars is not far on the compact bike. To channel your inner Moto3 fantasies, push back into the seat, tuck in, and head for the canyons. 3. The 2017 Yamaha R3 has full-size superbike styling. No one will know you’re on an entry-level bike by looking at the styling and graphics; everything is proportional and sharp looking, and the third-liter motor sounds cool when accelerating hard. It looks like a YZF-R model. 4. Nimble and light, the R3 is a great learner’s package. With a 368-pound curb weight and agile handling, the R3 is not a physically intimidating machine. Maneuvering at slow speeds or in parking lots is easy with the sub-31-inch seat height—one of the lowest in its class. 5. The little twin excels in the mid- to upper-range of the powerband. The most robust power can be found from 7000 rpm on up to the 10,500 redline, so keeping up with aggressive freeway speeds is not a problem, at least for lighter riders. You can accelerate for a pass while in top gear, though downshifting will get the job done faster. 6. The windscreen sends most of the windblast over your helmet. The windscreen is well positioned; buffeting at freeway speeds is kept to a minimum, reducing fatigue. There’s plenty of room to push back to the passenger pillion should you want to tuck low and scrub off even more windblast. 7. The non-adjustable suspension on the YZF-R3 is appropriately tuned. You’ll feel the lumps and bumps of traffic-weary roads in urban environments, but the YZF-R3 takes them in stride. In the canyons the suspension is firm enough for a sporting run on smooth asphalt, and the agile handling lets you flip into and out of turns. Cracked and rippled roads will keep you from twisting the throttle too hard, though, as the suspension is less reassuring in rough conditions. 8. The narrow Michelin Pilot Street tires are confidence inspiring in the canyons. With the limited power demands on the tires, the Michelin Pilot Street rubber is fine. I was able to push hard in the canyons, carrying plenty of lean angle when necessary. There was no hint of pushing and the feel is good. 9. The secret to canyon strafing on the R3 is to carry corner speed. The R3 is not about hard braking and acceleration. The engine, brakes and tires are more about smooth riding and maintaining momentum. 10. The single 298mm disc up front is mostly capable. The YZF-R3 is far from a heavy bike, so the single front rotor and four-piston caliper is a reasonable choice and takes care of most of your stopping needs. If you find yourself at top speed and braking aggressively, you’ll be a bit disappointed as there’s not as much power as you might like. However, for city riding, initial engagement is soft with plenty of grip on hand when needed. 11. Mirrors are sharp with no vibrations, but your shoulders intrude on the view. By nature, fairing mounted mirrors have a harder time getting around a rider’s shoulders, but on a physically small bike this is amplified. I have to tuck my elbows close against my body to get a full view behind me. 12. The YZF-R3 is an economical ride, with a claimed 56 mpg. While the 3.7-gallon tank may take you 200 miles between fill-ups, that thrifty mileage drops if you wind it out in the canyons. Droning on the freeway will also keep your mpg below 50. Motorcycles for new riders can be dull, or they can be exciting. With a high-revving twin, full-sized styling, and confident handling, the 2017 Yamaha YZF-R3 is great for budding sport riders, as well as commuters of all skill levels who want a frugal ride with panache. Get an Insurance Quote For The 2017 Yamaha YZF-R3 – Save Up To 50% with Allstate!